Ahoy Matey! 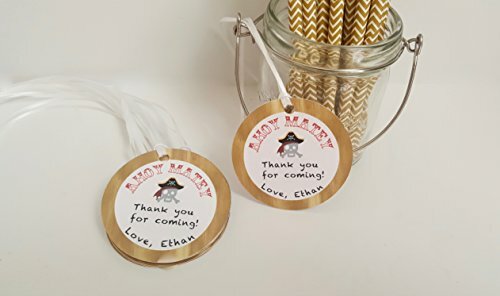 Dress up your favors with this adorable pirate themed favor tag! This listing is for a set of 12 personalized favor tags. Each tag is approximately 2.5 inches and comes with a ribbon attached so you can easily tie onto favor. When ordering, please input the personalized name for the tag in the notes section. If you have any questions about this product by The Pink Papermill, contact us by completing and submitting the form below. If you are looking for a specif part number, please include it with your message.